As with most things, there are advantages to each category. In general terms, the sound absorbency rating is likely to be higher with office cubical type dividers. Why? The thicker the divider, the more sound it will absorb. 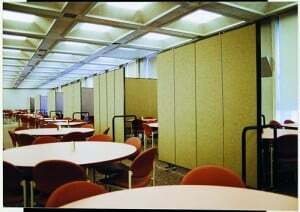 These types of dividers were designed for office use where a quiet environment is desired. So by their very nature, they are thicker and thus heavier/harder to move around. Both the additional panel material and the frame which encompasses it adds to the weight. Room dividers on casters open up a whole new world of efficient use of space in an economical fashion. Since they are on casters, they easily roll as needed within the room, or for that matter within the entire facility. How are such dividers used? Let’s take a look. Most churches have an open room to use for various ministries within the church. The room may be called the Fellowship Hall, the Multipurpose room, the Family Life Center, the Sancturium, etc. Regardless of what the room is called by the congregation, its function is exactly the same to provide a usable space where the various ministries/works of the church can be performed on a consistent basis.